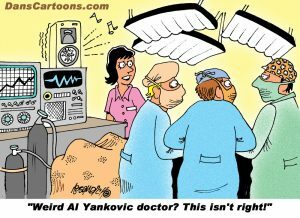 Surgery cartoons have been a big part of my cartoon production in the medical cartoons genre that I’ve created over the years. 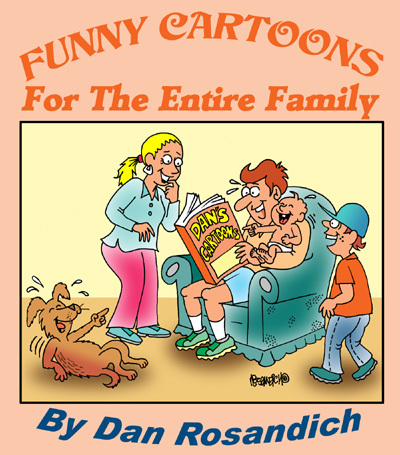 Probably dreaded by most people, I try to shed a little cartoon humor on this subject and will provide access to a list of some favorite surgery cartoons I’ve created over the years. It became apparent from looking at my medical cartoon images in my collection, that a lot of them focused on surgical themes or showed gags in a surgical theater. I decided to collect some favorites to share here and offer them as part of my cartoon catalog to publishers, medical consultants and authors who specialize in surgery related content. Perhaps you’re writing a collection of surgery humor quotes or a collection of funny quotes about surgery recovery and some cartoons may just be what the doctor ordered to insert throughout the collection! Doctor tells patient in operating room that surgery will take eight hours! These of course are cartoons depicting actual surgeons in the cartoon itself, performing some form of surgical procedure in a surgery room setting. 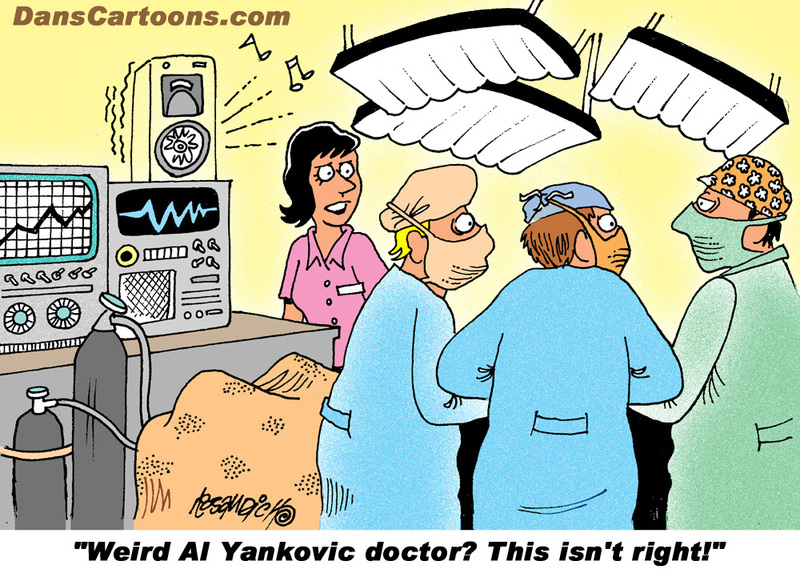 The are not just you ordinary everyday generic single panel gag cartoon that relates to medicine. Any of these comics can be edited to your preference by the way. By that I mean, you get to change the gag line underneath the cartoon that would better suit your visitors or readers. Or you may want me to illustrate that cartoon in a different way. Perhaps eliminating a specific type of surgical equipment from the back ground of the image or replace a male surgeon with a female surgeon.